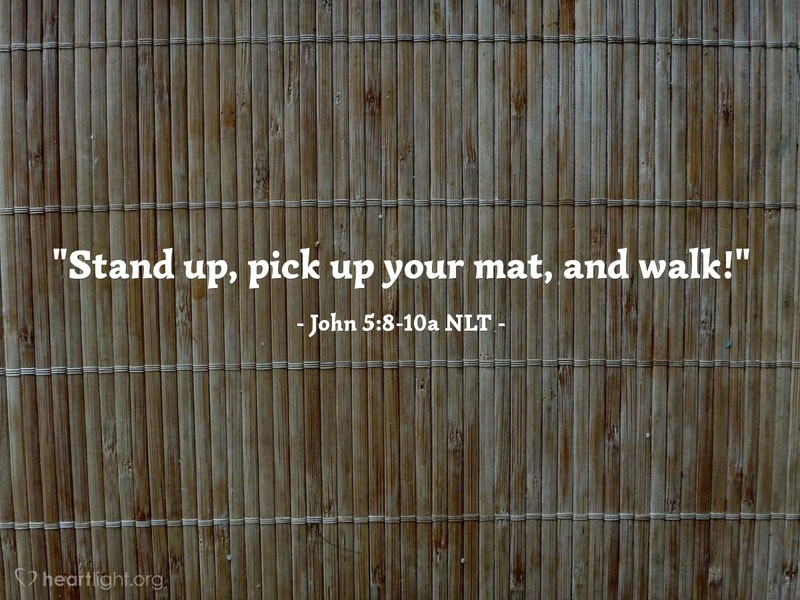 Jesus told [the sick man by the pool of Bethesda], "Stand up, pick up your mat, and walk!" Instantly, the man was healed! He rolled up his sleeping mat and began walking! But this miracle happened on the Sabbath, so the Jewish leaders objected. God created the Sabbath to be a day of blessing, rest, and reverence. Isn't it strange how easily the rules of misplaced religion can ruin the blessings God longs to bring us? Because Jesus did something the Jewish leaders classified as unlawful on the Sabbath (rather than looking at God's intent in establishing the Sabbath), the Jewish leaders discounted the miracle, ignored the joy of the one healed, and criticized the one who provided the blessing. How often do we do the same sort of thing in our religious lives? Hmm... better move on; that's too convicting. Bottom line: Let's make sure our traditions and rules don't keep out God's blessings simply because they don't fit into our religious agenda. God, forgive us for turning your blessings into hardships, your joy into drudgery, and your grace into a set of rules. Forgive me for not rejoicing more with those who rejoice and for not comforting those who have been wounded. Help me find the balance of Jesus in knowing your will about my religious life while responding to the needs of those around me. In Jesus' name, I pray. Amen.